With the 100 year anniversary of the end of the Great War my friends and I decided to play an alternative history game. 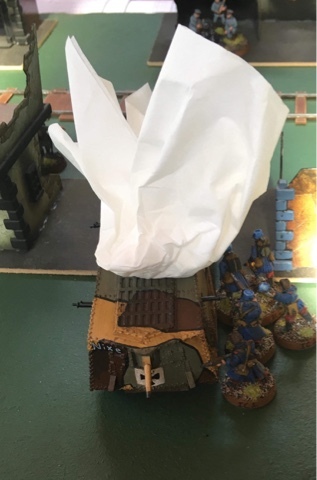 We will be using late war lists from the warhammer historical Great War rules and a home made White Russian list. The Russian conscripts would suffer from an animosity type rule with a roll of 1 resulting in a stop work meeting, 2-5 acting normal and 6 a ferocious rush of blood or vodka surging them on. 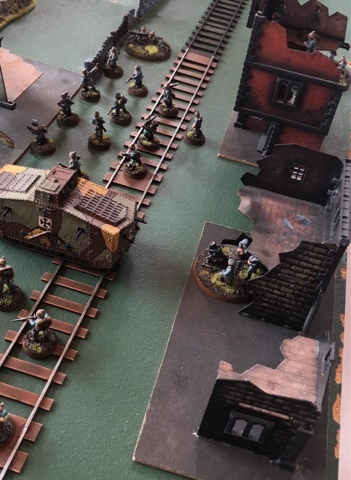 The game set up was pretty simple with the Germans occupying a village and a strategic rail line that would deliver the Russians from turn 2. The French plan was to take the village as quickly as possibly before too many of the Russians arrived. 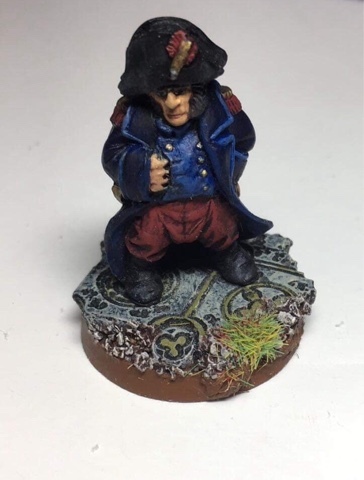 The French would be lead by this little guy. 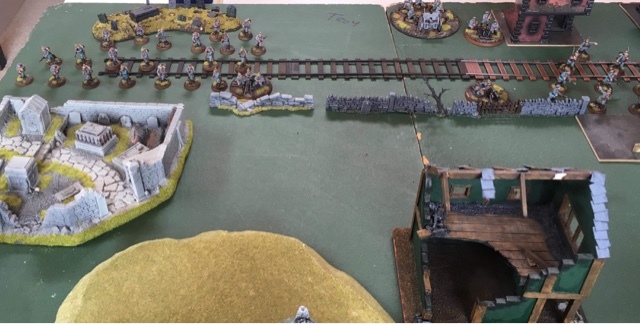 In a roll off for the first turn the Germans won the advantage and would start the game. 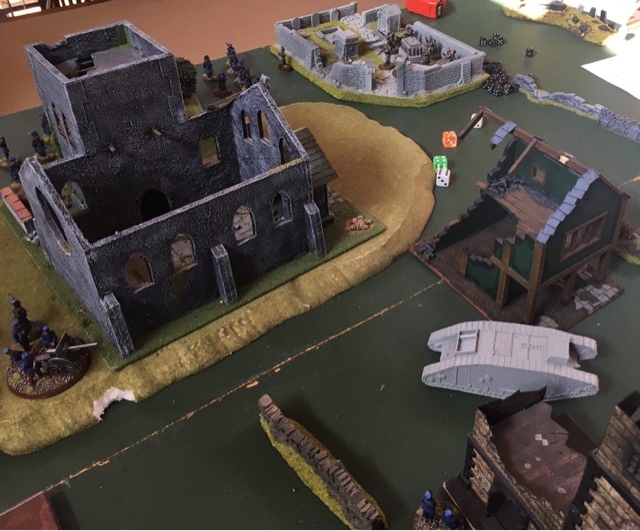 The German High Command and artillery took advantage of the ruins at the back of the battle field with the infantry and a couple of the deadly hmgs deployed forward behind the low walls. 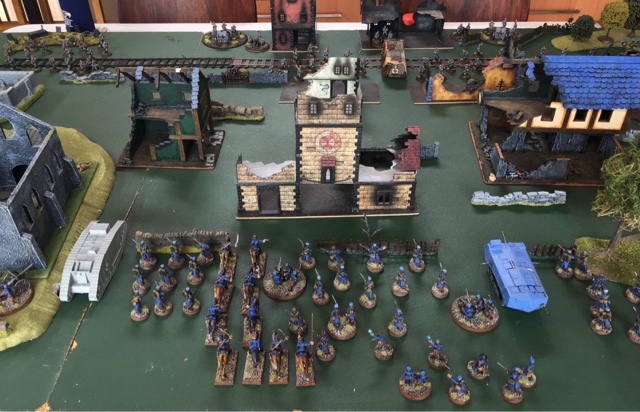 With approximately 1400 points on each side the French deployment was pretty congested. 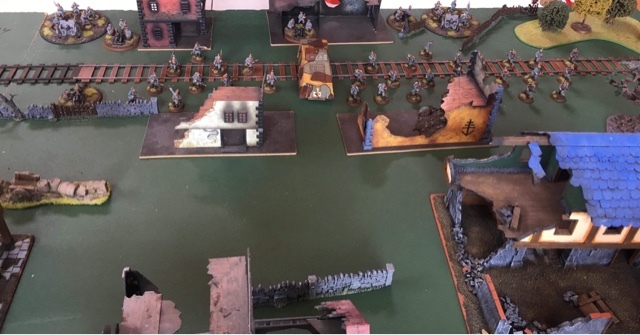 The cavalry would not last two turns before the artillery and hmgs would wipe them out. 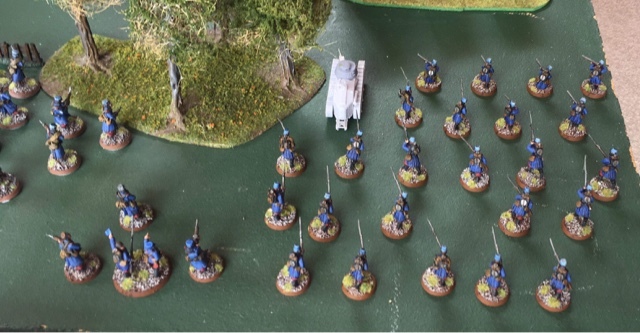 The right flank of French infantry and a FT17. 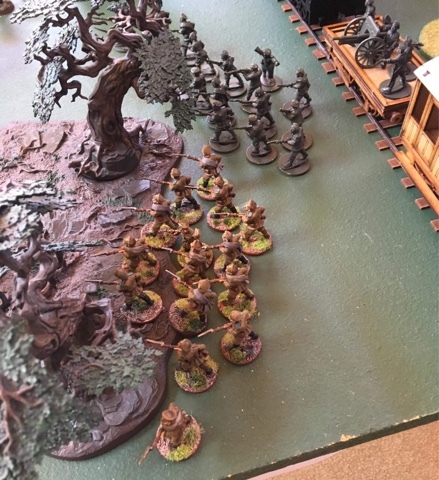 The left flank of French marines / veterans would be delayed throughout the game by the forest in front of them. The St Chammond would assist and survive the game. 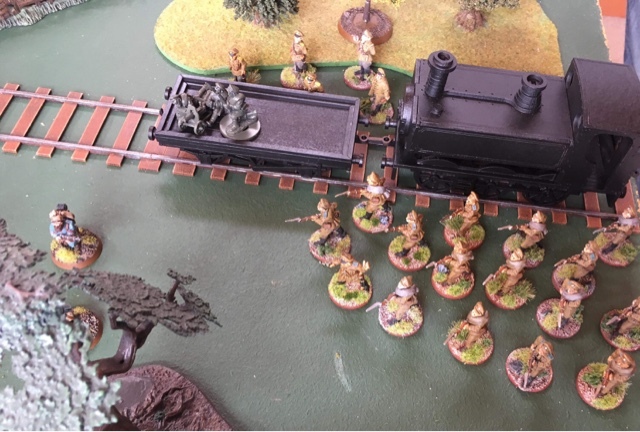 The first turn involved shots across the board but things heated up on turn 2 with the arrival of the Russian train and hmg. 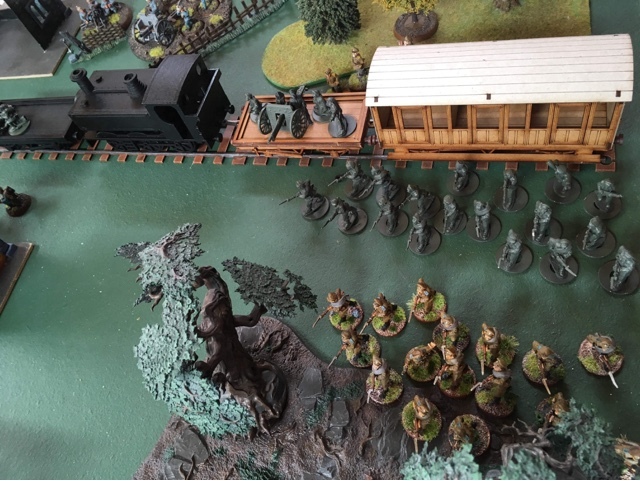 The arrival of the Russians also resulted in a lucky conscript rifle shot that destroyed the FT17. Turn 3 the German bombers took the central right buildings and destroyed the French infantry threatening. 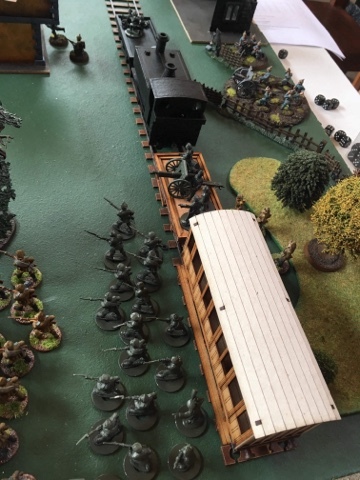 Turn 3 also meant more Russians arriving by train including another field gun for the Hun. The Russians from turn 2 also decided it was time for another stop work meeting to discuss payment that appeared to be late this month. Another unit of French infantry decide turn 4 was the time to retake the ruins their bros lost. 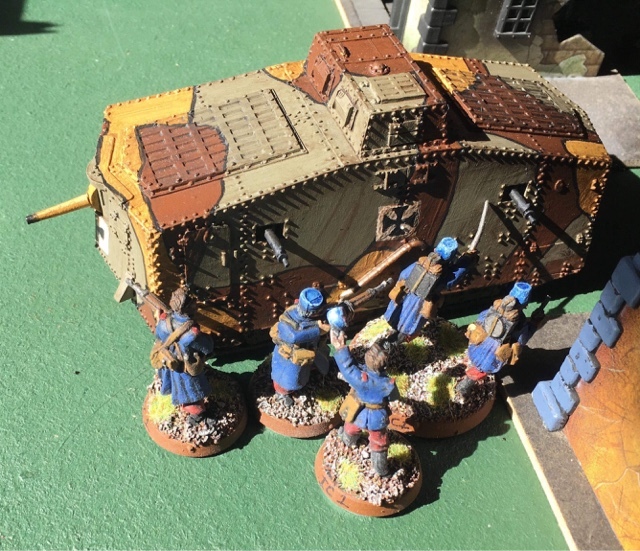 The st Chammond vehicle guns would assist. 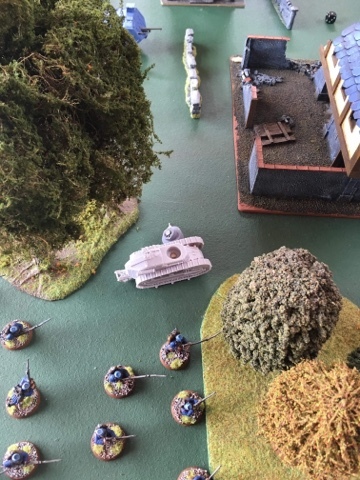 The French also emerge in the centre to challenge the German tank. They would not survive the crossfire of hmgs that greeted their courage in emerging from the safety of the ruins. 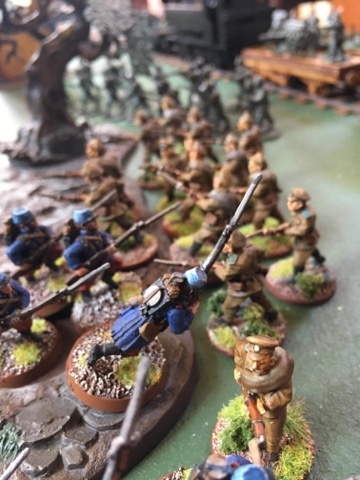 The Russian flank consolidates in the face of advancing French infantry. 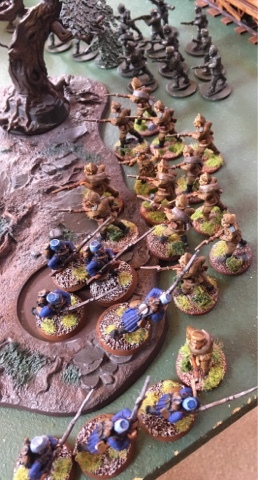 A vastly outnumbered French infantry platoon fixes bayonets for the charge into the Russians. 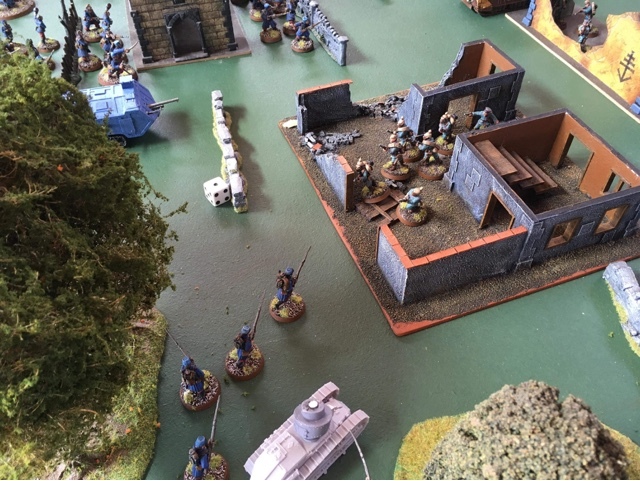 The Russians hold their line and after two turns wipe out the French platoon. 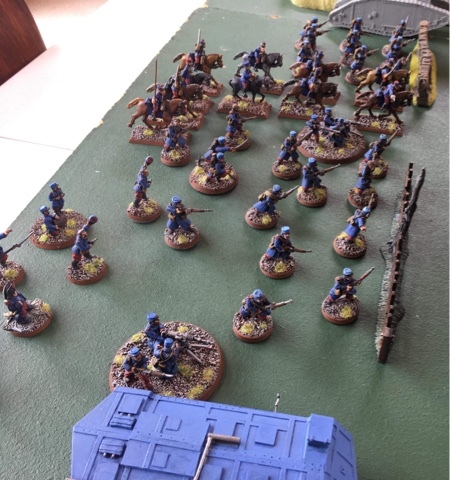 After witnessing their platoons wiped out, the infantry command charge the German tank that had been disabled by an earlier charge from their now departed comrades. 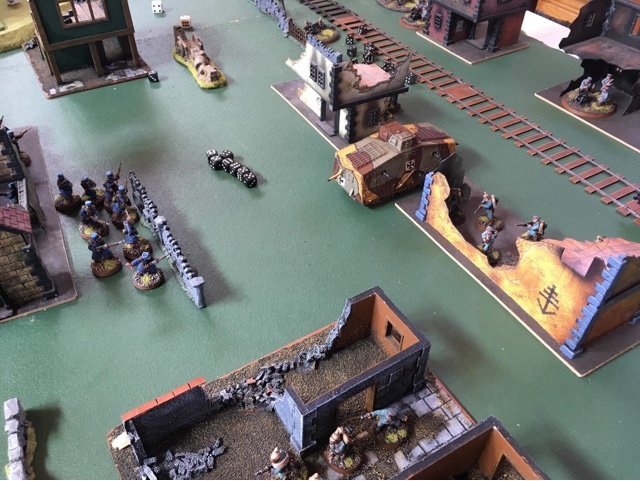 This time the command find the proper place to fix their grenades and the tank is destroyed. 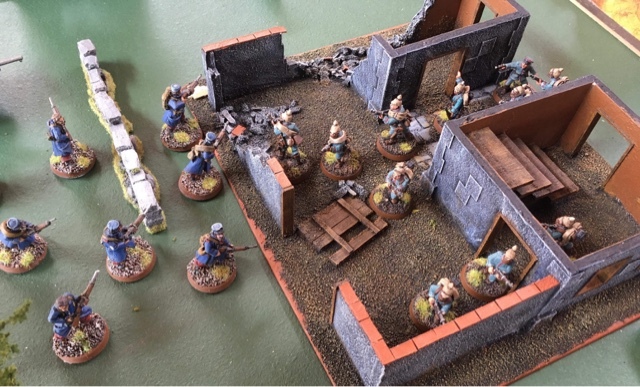 The command group consolidate into ruins close to the German deployment zone. Over on the left flank the forest delayed the French veterans and the Germans controlled the cemetery ruins. 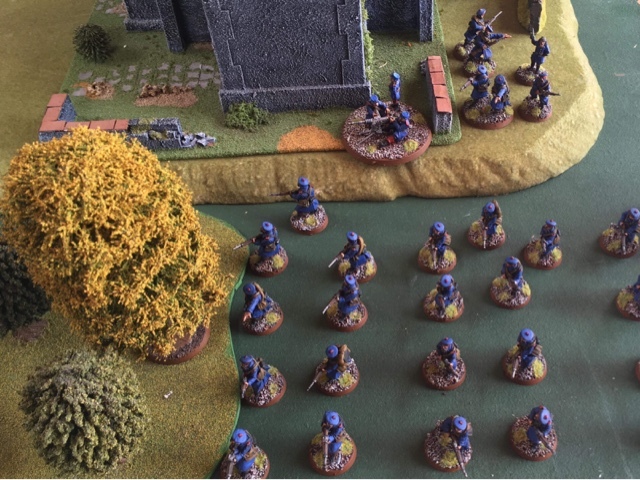 The Germans had already withstood two platoons emerging from the forest and the ruins next to it but the final platoon enticed an enemy platoon out. 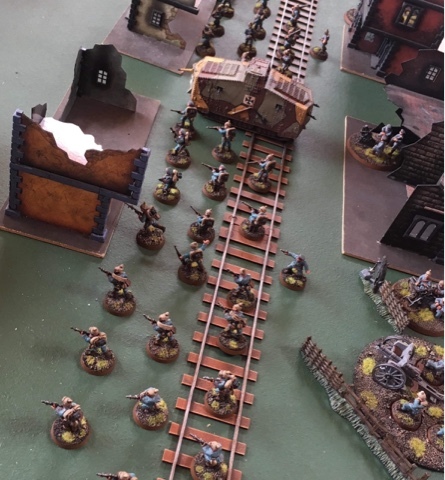 The Germans suffered heavy casualties from the supporting hmg and Mark 5 tank fire before the last unit of veterans charged and routed the Germans. 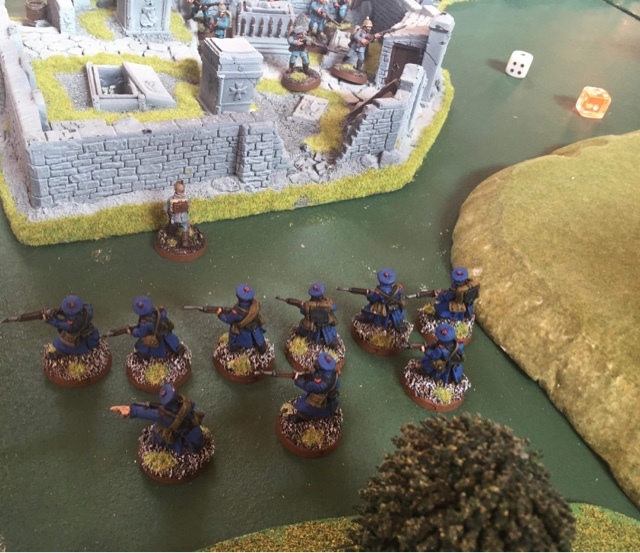 With that last combat, the six turns were finished and although the French did not take the German village both armies suffered tremendous casualties with most infantry units (and the unfortunate French cavalry) wiped out. 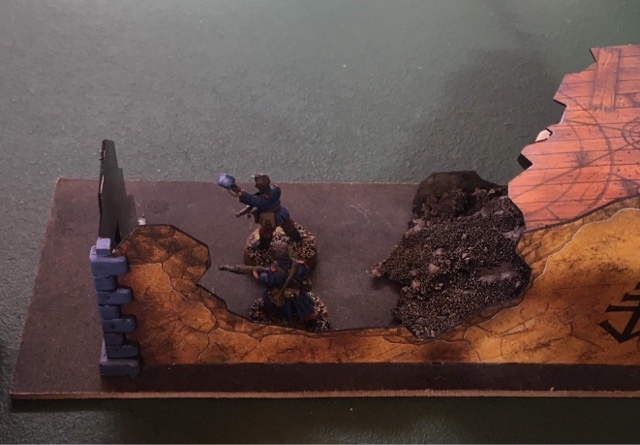 A bloody stalemate was the result with no side gaining any new foothold on the table. An excellent game with even better bros with the Russian list requiring a few tweaks but is fundamentally sound.